Walking with Jesus: Day 139: Luke 19:1-27 & Psalm 135 - Did Zacchaeus Buy His Salvation? Day 139: Luke 19:1-27 & Psalm 135 - Did Zacchaeus Buy His Salvation? 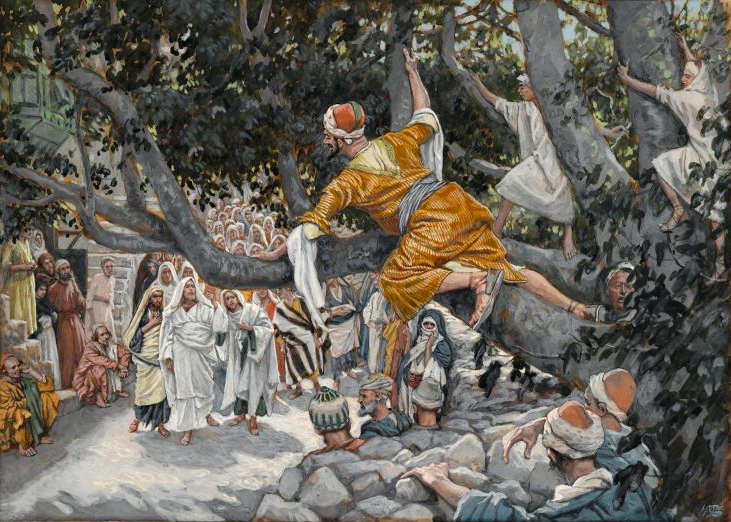 Did Zacchaeus Buy His Salvation? Almost everyone knows the story of Zacchaeus, who "was a wee little man, and a wee little man was he." He was a notoriously corrupt tax-collector who wanted desperately to see Jesus. Being "vertically challenged," he had to climb a tree to get a glimpse of Jesus. But it was not Zacchaeus seeing Jesus but Jesus seeing Zacchaeus that was most important. When Jesus saw the short tax-collector/extortionist in the tree, He asked him to come down and then invited Himself to his house. Immediately, the religious people began gossiping about how Jesus was going to be the guest of a notorious sinner. Zacchaeus then astounded the condemning crowd by announcing his incredible new refund program: a fourfold refund of any money he had extorted from anyone, on top of giving half of his goods to the poor. The challenging part of this passage comes next. In response to what Zacchaeus says, Jesus proclaims, "Today salvation has come to this house, since he also is a son of Abraham. For the Son of Man came to seek and to save the lost.” (vv. 9-10) This prompts the question: Did Zacchaeus buy his way into heaven? Did he earn salvation by his generosity and good works? In a word, no. But the answer is not so simple. It was necessary for Zacchaeus to make this restitution. He needed to show the fruit of repentance by returning his ill-gotten gains, but he did not buy salvation with his generosity. Jesus selected Zacchaeus for salvation when He called him by name and asked him to come down. His salvation was entirely by grace and not of works. But his salvation did indeed work in his heart and bore the fruit of real repentance and life change. Sometimes we can confuse the root and the fruit in salvation. Our salvation is rooted and grounded in God's free grace. We are saved by grace alone, when we trust in Jesus Christ for our salvation. But a changed heart issues forth a changed life, and a changed life bears fruit that is evidence of that change. So, has your heart been changed? How does your life reflect it? living stones of the house of our God! we sing to Your name, for it is pleasant! to be Your own eternal possession. and that You are far above all gods. and brings forth the wind from Your storehouses. and gave us an eternal inheritance with You. We bless You, O Lord, the one true and living God!